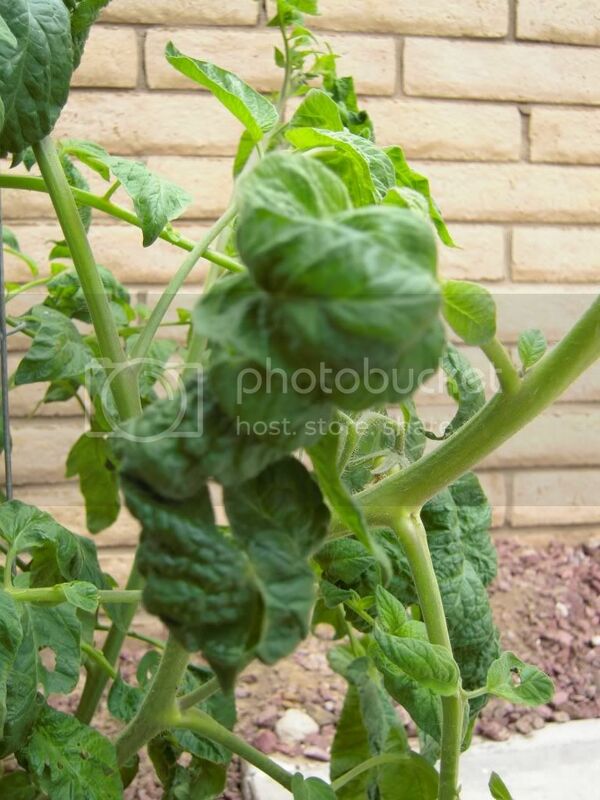 Tomato leaf curl, Mosaic virus, or over/underwatering ? I'm a new gardener who has planted veggies for the first time to teach my 2 and 4-year old sons about food production. I'm very excited about our tomato plants (one cherry, one heirloom, one roma, and one hybrid), but the heirloom has drooped considerably, the leaves roll downwards and even shrivel up. They seem thicker and dark green and some leaves have raised areas that look like blisters. There are no yellow or brown fringes or spots but the plant looks terrible and I fear a virus--tomato curl leaf or mosaic? Does it matter? The soil is very sandy here in San Diego, but I added good top soil when planting. Please, can someone tell me I'm over or underwatering or maybe have a soil deficiency that can be corrected? I fear a virus that requires destroying this once beautiful plant and I'm hoping someone here can help me to save it. I have photos, but can't figure out how to attach them here--any advice? I can't help you ID the problem, until I see a picture, but someone else might be able to. You'll find directions for how to post pictures here. That should do it! What say ye, intelligent gardeners? A long time ago, when people had to grow their own food, they were very careful to do only what they knew would work, with plants whose seed had been saved from successful plants in years before in the same area. The people learned all their lives, from their parents, aunts, uncles, grandparents, and fellow farmers/villagers, how to grow food: what worked best in their location, with their soil, rainfall, temperatures, and other conditions. Any deviations from what was known to work were very scary, and were usually tried only in desperation. The mechanisms of disease beneath the soil were not understood, and we're still learning about them even now. Modern gardeners are very lucky to have the Internet, where we can ask other gardeners questions about our problems. We have an international "village" of gardeners! We're also lucky to have the seeds of heirloom as well as hybrid varieties of fruits and vegetables; this way, there's bound to be something that will work for almost everyone who wants to grow food. I'm sure someone here will know what's going on with the tomato plant in question, but in the meantime, "I'm not sure, but our other tomatoes look really strong, don't they?" sounds good to me! Vergil has been fast asleep for over 2 hours, since we returned from being away all day (left the house at 0645 this morning). My first extended session here at the forum since before his surgery. It is not anything having to do with nutrients or water. I would say either herbicide, maybe in the soil rather than drift from spraying because of the way the whole plant is affected, or virus, although I would expect virus to look a little different. Thank you for the helpful responses. I remembered after my post that I should mention that I heavily pruned the plant about a week ago. Maybe the plant is a bit worse now (shock? ), but it was exhibiting these signs before pruning, too. if you have sand soil then it's not likely you are overwatering it. May be the water is getting drained away before it could be absorbed. Does the plant stays that way all day or does it recover at night? It looks like that at night, too. Someone at Home Depot suggested that I try to aerate the soil by poking holes around the base, but not too close to the roots. I stuck a stick about 8-10 inches down, about 5-6 inches from the roots, and around the base of the plant, and the stick seemed slightly damp but not wet. That made me think the sandy soil wasn't totally dried out underneath...for whatever that is worth. Should I spray milk? I saw somewhere that that prevents mosaic virus from spreading, but I suspect it's too late now for that. I've got nothing solid; sorry... that soil looks really hammered though, some compost might go a long way towards making things better. Are you fertilizing? If so, with what? I confess that almost a month ago, I sprayed it (not too wet) with a well diluted dose of "Ortho Max Garden Disease Control" active ingredient: chlorothaomil since I saw this coming on. Might I have caused it to grow worse? Nothing has been planted in this area for well over ten years--if it is in the soil, what should I do for next year? Thanks for the compost tip--I'll get some--and the education! Agree with HG that is not good looking soil. Is that a house wall it is next to? And the square corner in the bottom right of the bottom picture is a patio or paver? Concrete can leach, making the soil near it very alkaline, which is not a good environment for growing veggies. Chlorothalonil is the most commonly used fungicide for tomatoes on the planet. It would not cause any problem. Always use pesticides at the recommended dosage, because if you don't you are just wasting resources while not solving the problem. Common lawn care weed killers could reside in the soil for many months, especially in a dry climate. 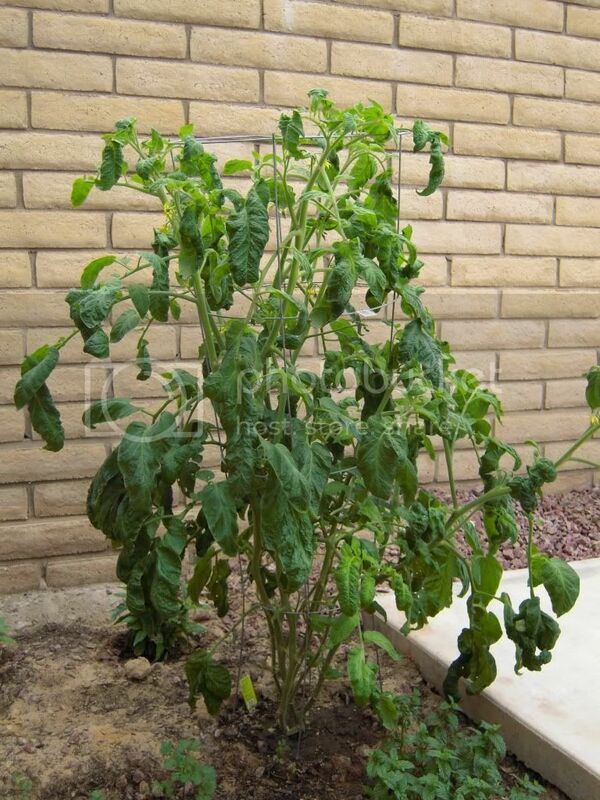 The rots of the tomato extend far from the plant so could have picked it up from several feedt away. The problem looks to be low level (and tomatoes are very sensitive). Adding compost and keeping the soil moist helps bind and break down the herbicides. You might want to grow using containers in that spot in the near future. I would go ahead and pull the plant for either reason, hebicide or virus. 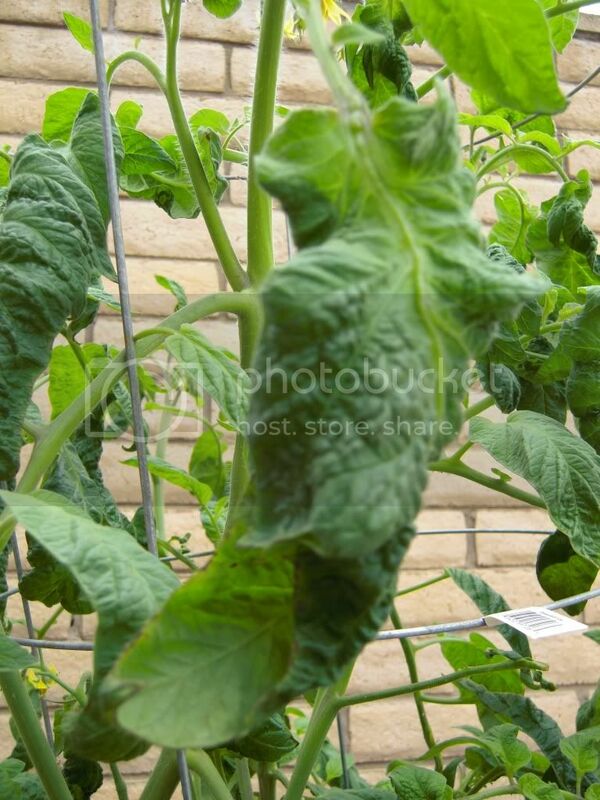 We seem to be seeing a lot of these tomato leaf curl problems reported here at HGG forum this spring. My impression is that most seem attributable to herbicide damage. Again, impression only, but most are reported by new /first time gardeners that started new vegetable beds where it used to be lawn, presumably treated with conventional weed and feed products. It's a sobering indicator of health status of the ground/soil/Earth under the green grass, and perhaps a wakeup call as well. Thank you so much for the education! I have immensely enjoyed reading your analyses and learning from the way you approach gardening. The consensus seems to be that I have a soil-related problem, and now that I can see the things you are pointing out--it makes sense. Yes, this spot is next to a concrete slab that used to have a storage shed atop it--and against a brick wall that has a huge concrete slab on the other side (a pool). If chemicals leach from concrete, then this soil has been filling with them for decades with little else. This is the sunniest side of the yard, but I can now see the downside. Thank you for teaching me! I'll keep trying!